US Ambassador David Friedman condemns PA for paying salaries to terrorists after bloody attack at Givat Assaf kills two soldiers. 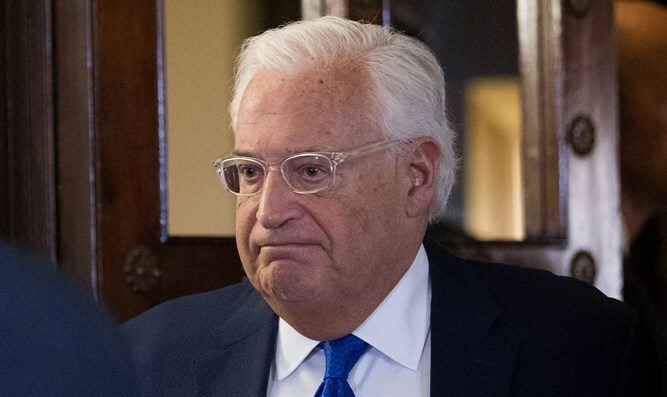 The United States Ambassador David Friedman condemned the Palestinian Authority's (PA) policies that reward terrorists after a gruesome shooting attack near Givat Assaf killed two IDF soldiers. "In the past week Palestinian terrorists have killed or wounded 14 Israelis in multiple attacks. The Palestinian Authority maintains laws that will compensate these terrorists and their families for their heinous acts. The PA can be a political body OR a sponsor of terror, not both," Friedman tweeted. Friedman had also condemned the shooting attack in nearby Ofra on Sunday that killed a premature child and wounded several others. “Another vile act of Palestinian terrorism last night included the shooting of a pregnant woman,” Friedman tweeted Monday morning. Friedman also condemned Hamas for celebrating the attack, and slammed the United Nations over its failure to back a US-led effort to condemn the Gaza-based terror group in the General Assembly.